By Costa Maragos Posted: May 2, 2017 6:00 a.m. The University of Regina’s commitment to the community has been recognized in a big way by United Way Regina. The University has received the Farm Credit Canada Commitment Award for its historic achievements and the success of its record 2016 fundraising campaign. 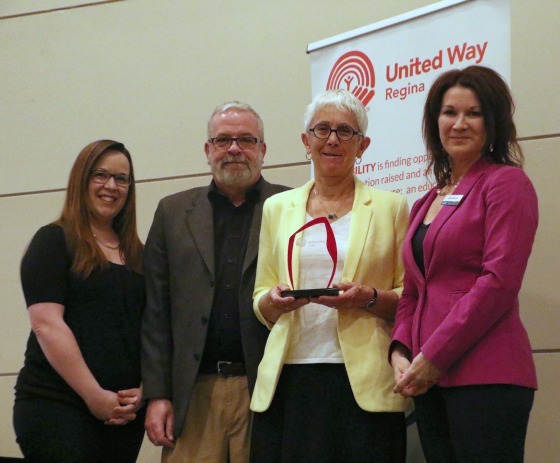 The award was presented at the United Way’s recent ‘Celebrating Regina’s Game Changers’ luncheon. The award is presented to an organization that mimics the commitment and engagement demonstrated by the United Way’s long-time partner Farm Credit Canada and its employees. Thanks to the work of campus volunteers, this year’s campaign raised more than $108,000, the highest amount ever for the University. In announcing the award, the United Way applauded the University for its strong organizational record in implementing a best practice campaign with a strong committee, co-chair leads and succession planning. It was noted the University was an enthusiastic supporter of the United Way Regina’s first crowd funding campaign “Get2Grad” which raised money and awareness for the United Way’s summer success initiative. At the same luncheon, the University received a nomination for the Community Fundraiser Award for 500 employees or more. These latest honours follow a tradition of recognition by the United Way. Last year, the University was presented with an Employee Campaign Team award, in recognition of outstanding personal and team commitment and leadership.